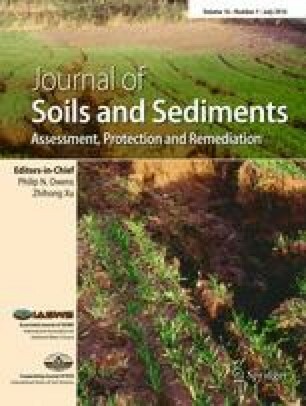 Sewage sludge and biosolid application to land is a common approach to fertilise soils, but sewage-derived contaminants like the antimicrobial agent triclosan, and heavy metals zinc and copper, are known to affect soil microbial communities. In this study, the tolerance to triclosan was examined for soil microbial communities chronically pre-exposed to one of two heavy metals (Cu or Zn) and the antimicrobial triclosan. This was investigated in two different soil types. The impacts of chronic exposure of copper, zinc and triclosan as individual compounds or in mixtures on soil microbial communities were assessed in soils collected from two sites. The first was a Horotiu sandy loam with ample carbon and nitrogen levels and the second was a Templeton silt loam with very low carbon and nitrogen levels. The end points used to characterise the response of the soil microbial community were biomass, metabolic activity and pollution-induced community tolerance (PICT) to triclosan (using Biolog EcoPlates). In addition, metabolic activities for individual substrates were examined and those that significantly changed with the applied treatments were identified. Exposure to mixtures of both triclosan and copper in the Horotiu sandy loam reduced microbial biomass, increased metabolic activity and reduced microbial tolerance to triclosan. The decrease in soil microbial tolerance correlated with an increased metabolic activity for N-acetyl-d-glucosamine providing a potential link between triclosan exposure and nitrogen mineralisation. Exposure to both triclosan and high zinc levels decreased microbial biomass in the Horotiu sandy loam but did not have an effect on microbial tolerance to triclosan. In the finer-textured and less fertile Templeton soil, microbial tolerance to triclosan and the microbial biomass were not impacted by copper/triclosan or zinc/triclosan mixtures. Mixture effects could become a cause for concern when soil microbial communities are exposed to triclosan in fertile soils with copper concentrations in excess of 50 mg kg−1 and could be especially important in the more coarsely textured soils. Current regulations for soil contaminants only consider the risk and effects of single contaminants. Greater protection of soil resources could result from considering mixture effects and soil types. We thank the New Zealand Ministry of Business, Innovation and Employment (MBIE) for funding, Alexandra McGill, Jacqui van der Waals, Marie Dennis and Ruth Falshaw for their valued contributions and Rod Ball and Mark Kimberly for providing statistical support to this study.